When our Jackson design team heads to the equator for surfing and rooster fishing 'R&D' trips, these super stretchy, featherweight, abrasion-resistant convertibles are their go-to amigos. This minute it's a pant, next second it's a short. Our super high-density weave (abrasion-resistant) is UPF 40+ (blocks 97% UVB rays), DWR (Durable Water Repellant), quick-dry, lightweight, packable & Easy Care. 6 pockets with mesh liners, including 2 zip security pockets and signature zippered side seam pocket. Removable leg panels with color-coded right/left zippers. Full length inseam action gusset. 'Mudflap' reinforced heel cuffs with adjustable snaps. Relaxed fit. 9" short inseam. 100% nylon. I use these as a salt water fishing pant. They are the best I have found for this purpose. The snap bottoms help keep the pants tight when you wade. The zipper pocket is a big plus. They dry rapidly. The zip-off into shorts works well. 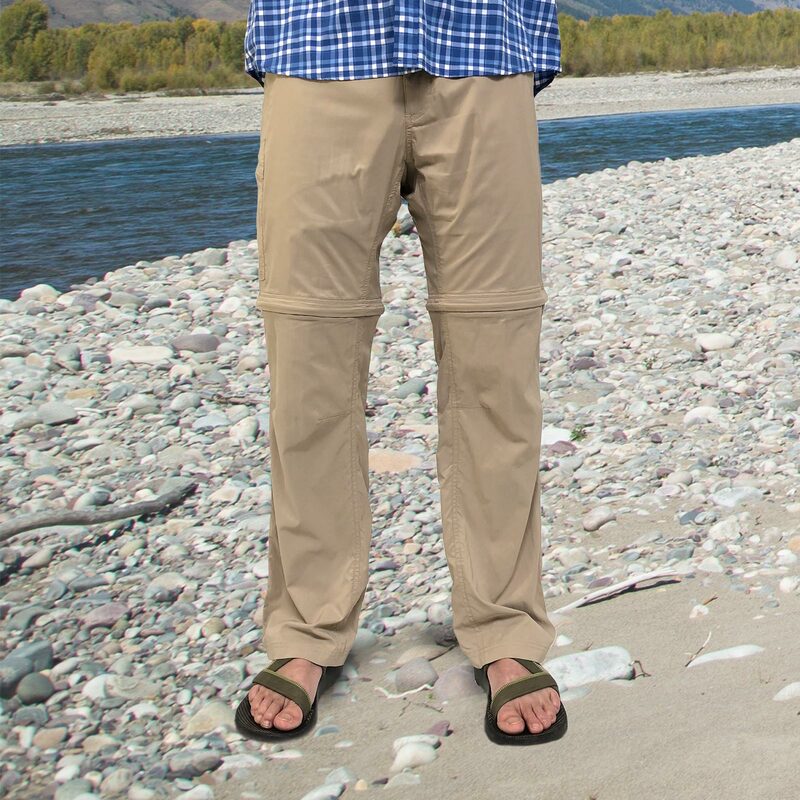 I would recommend these pants to any and all fishermen. Excellent service! Very nice people! So I had some time to kill and wondered into their Denver store. Usually, I really don't like going downtown or going to stores, but long story short, the manager really knows customer service and patiently listened to my needs. Their culture and company mission statement is spot-on and overall a company that really does exist for those of us who enjoy (need to be) outdoors, not just to look "outdoorsy." I have no problem with whatever trend others follow, but it's been difficult finding clothes and styles that focus more on quality than stuff for the Hummer people who never go off road. MK is my new clothing equipment co. Overall I like the pants. Very comfortable!! I am not a fan of relaxed fit. I wish it was the classic fit. I’m 6’-4” and 215 so I’m not skinny but to huge either. I’ve got chicken legs and relaxed fit pants swallow me. I will agree with the waist size though. They are smaller. I’m between a 36-38 and a 38 is tight. All other MK pants I have are 38 and they are quite lose. These pants are great for the trail or casual out on the town. Fit is ok but waist size is slight small compared to other MK pants.